As with Able Archer exercises from previous years, the purpose of the exercise was to simulate a period of conflict escalation, culminating in the US military attaining simulated DEFCON 1 coordinated nuclear attack. The 1983 exercise introduced several new elements not seen in previous years, including a new, unique format of coded communication, radio silences, and the participation of heads of government. This increase in realism, combined with deteriorating relations between the United States and the Soviet Union and the anticipated arrival of Pershing II nuclear missiles in Europe, led some members of the Soviet Politburo and military to believe that Able Archer 83 was a ruse of war, obscuring preparations for a genuine nuclear first strike. In response, the Soviets readied their nuclear forces and placed air units in East Germany and Poland on alert. The apparent threat of nuclear war ended with the conclusion of the exercise on November 11. 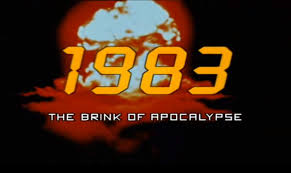 Historians such as Thomas Blanton, Director of the National Security Archive, and Tom Nichols, a professor at the Naval War College, have since argued that Able Archer 83 was one of the times when the world has come closest to nuclear war since the Cuban Missile Crisis in 1962. This entry was posted in Nuclear False Alarm, Nuke and tagged Able Archer 83, Nukes. Bookmark the permalink.